The Walk to Emmaus is an experience of Christian Spiritual Renewal and formation that begins with a three-day short course in Christianity. It is a once in a lifetime opportunity to experience the love and grace of God in a unique manner. During the 72 hours, God will meet you where you are in your relationship in order to bring you closer to Him. Countdown to the Next Walk! 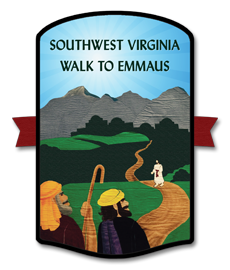 As the Board of Directors for SWVA Walk to Emmaus makes plans for the upcoming year and discusses ways to strengthen and grow our Community, I find myself thinking about the past 23 years that I have been blessed by my Emmaus family. Each of you is a vital part of the body of the SWVA Emmaus Community and we want to hear your ideas, concerns and suggestions on how to best serve those around us. Through your active involvement in this Community, we can better fulfill the purpose of Emmaus – to renew the church as the body of Christ in the world, to deepen discipleship and build Christian leaders in their churches and communities. I came across this statement recently while looking through some Upper Room Emmaus materials and it really resonated with me: “Personal Christian growth is not a solitary affair, spiritual growth involves the support of other Christians” – this is what the SWVA Emmaus Community provides each of us — this love, support and encouragement is the very heart of our Community. We appreciate all that each of you do to support our activities and events. I pray the Holy Spirit will give you direction and clarity in all that you do, and that each day will bring you fulfillment, joy and peace that passes beyond our understanding.